HomeGold IRA BlogBuy GoldWhat is a Diversified Portfolio in This Economy? The White House remains under assault from the media, for issues ranging from staff firings to Russian collusion, following the first Congressional special election of the season, which took place in Pennsylvania’s 18th District. Any hope of domestic tranquility was shattered yesterday when Lamb, the Democratic contender, was announced as the winner of the election in a district that had supported Trump with a 20% margin of victory. Equity markets are ten percent off record highs, bitcoin has fallen more than fifty percent from recent record highs, and now there’s talk again of a housing bubble. Meanwhile, even if the Fed is able to keep to its planned interest rate increase schedule, bond yields will barely beat out the desired inflation rate, so what is a good investment option for this crazy market and economy? In spite of analyst’ concerns that the stock market is oversold, over-valued, and primed for a collapse it remains the primary component of most financial portfolios. With high levels of consumer satisfaction, a growing percentage of investors are seeking safety in an under-performing U.S. dollar, which is necessary at this point, due primarily to the rapid rate that China has and continues to dispose of U.S. debt instruments. Housing starts are down and real estate bubble discussions continue to fester. Having witnessed the possibility and actuality of wealth creation in early cryptocurrencies, many investors are investing a greater portion of the portfolio in products far riskier than recommended. The stock market is long in the tooth, but will continue to be a standard. The dollar is in serious danger of status reduction or even replacement as the premier global reserve currency, due to China’s petrodollar circumvention agreements with more than twenty countries, by way of the Shanghai Energy Exchange, where oil is paid for in Yuan and immediately converted to gold and Russia’s replacement of Saudi Arabia’s military defense agreement with the U.S., by selling them the S-400 missile system which is completely self-contained. So every popular investment tool has increased risk in the current economy, which is why the typical 5%-15% physical precious metals portion of the portfolio is probably not enough. Physical precious metals shine their brightest during an economic cataclysm. If the International Monetary Fund removes the dollar as a global reserve currency, the result could be a currency devaluation and market collapse that could quickly impose a sixty percent portfolio loss. Precious metals could easily gain 500% under these conditions. The typical 10% position could almost offset the loss, but a 25% position could provide an 80% profit and a 50% position could provide a 220% gain. 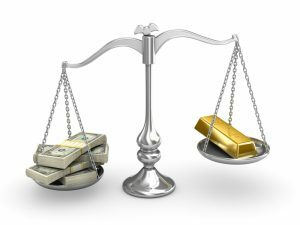 Potential gains are relative, but precious metals are the best financial protection from dire economic occurrences. Don’t gamble with your legacy and don’t get caught without appropriate portfolio protection. Call the experts at American Bullion for assistance, at (800) 653-GOLD (4653).